I went to elementary school in the early to mid-1980s, the heart of the Reagan era, during which time duck-and-cover drills were conducted approximately once a quarter. These exercises will still be familiar to California schoolchildren, where they are applicable in the event of an earthquake. But "duck-and-cover" grew out of another, more dire fear - nuclear bombardment. (For the sake of discussion, let's pass over the exponential disparity between the relative benefits of hiding under one's desk during an earthquake versus during almost guaranteed annihilation.) It's only been about 25 years since duck-and-cover drills - or any other routine exercise of preparedness for nuclear attack - have been a regular part of American life. Their diminution coincided immediately with the conclusion of the Cold War, a largely fictitious "conflict" that consisted of a series of fantastic narratives told to us by our government (and by other governments to their populations) that pitted mainly the US and the USSR against each other in a deadly struggle to prevent each other from exploding a nuclear bomb - something neither nation ever intended to do. 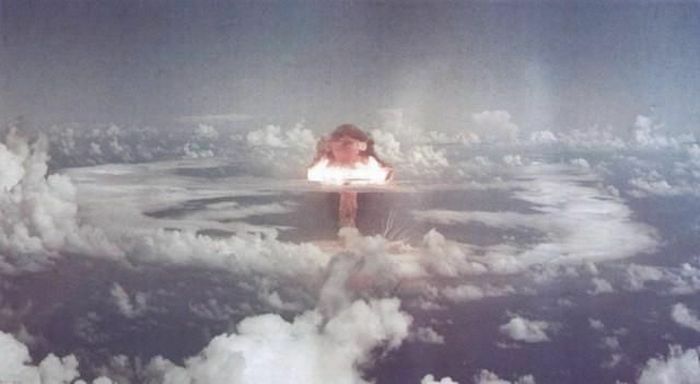 When the Cold War ended, nuclear weapons were utterly forgotten, and in the space of no more than five years, the threat of a nuclear holocaust - a dominant feature of global discussion for four solid decades - simply evaporated. Of course, now we face other, more imminent and obvious threats, although there is also a sense that these, too, are nonetheless overplayed by the enforcers of "safety" that we elect to public office. But these newer threats both conceal and intersect with the quietly persistent danger of nuclear weapons, and Lucy Walker's skillful and responsible documentary does us the invaluable service of bringing our heads out of the cloudy smoke screen of "terror" and back to a certain level of reality. Countdown to Zero recounts how we came by nuclear weapons, their role in the last half century of global affairs, and the continued post-perestroika threat that they present - in our own hands, in the hands of our allies, and in the hands of non-aligned states and their potential use by terrorists. Far from being alarmist or propagandistic, Countdown to Zero is a sober film that includes a multitude of voices, including some who once believed in the strategic value of nuclear weapons as a deterrent. We also hear from scientists, journalists and historians, and former heads of state, including Mikhail Gorbachev. The film cribs its structure from President Kennedy's famous address to the United Nations on the topic of nuclear weapons: "Today, every inhabitant of this planet must contemplate the day when this planet may no longer be habitable. Every man, woman, and child lives under a nuclear sword of Damocles, hanging by the slenderest of threads, capable of being cut at any moment by accident, or miscalculation, or by madness. The weapons of war must be abolished before they abolish us." The film is divided into sections roughly organized around the three factors included in the phrase "by accident, or miscalculation, or by madness." These sections examine the history of nuclear technology, the stakes of the Cold War, the ease with which military nukes can be deployed (and the ease with which relatively simple communications errors can lead to a launch), the mechanics by which terrorist organizations could obtain and use a nuclear device, and the exact countries that have nuclear weapons and the approximate total number that exist. Walker assembles a variety of talking heads, some of whose contributions are plain and direct (Valerie Plame, Ahmed Rashid), and some of whom seem merely self-serving (Tony Blair, Pervez Musharraf). But the specifics are urgent and compelling - the story of inter-agency quarrels that led to American nuclear enable codes all being set to zero during the height of the Cold War is all too credible. Walker's film has a very plain message, a refreshing boldness of purpose that puts Michael Moore's condescending and unappealing films to shame. Countdown to Zero is a reasonably apolitical film that brings us back to brass tacks on the subject of nuclear weapons, which will remain the direst of threats until they are verifiably eliminated from the face of the earth. The enhanced 1.78:1 transfer by Magnolia is very good. Contrast and detail are outstanding, with nary a speck of compression evidence. Sharp color and deep blacks nicely complement the film's thoughtful design and excellent editing by Brad Fuller and Brian Johnson. The movie features good use of digital graphics and animation, which are also well-replicated here. The 5.1 surround soundtrack is good, although the film's content prevented me from deep engagement with it. Going back after the movie was over, I realize that the mix is quite vibrant in spots, and good sound effects work has enhanced much of the archival footage. The track has been given much consideration by the filmmakers, who have done more sound work here than on the average documentary. Magnolia has included some pretty interesting extra features on the disc. A group of Deleted Scenes (9:48) includes some crucial information on the Cuban Missile Crisis and Robert Oppenheimer that I'm surprised didn't make the final cut (the feature runs only 89 minutes). Additional Interviews (40:50) include unused footage dealing with the concept of nuclear winter, as well as more from Jimmy Carter and his former National Security Advisor Zbigniew Brzezinski. Archival Footage (64:33) is a bit of a misnomer, as the section actually consists of three indispensible government-funded historical documentaries: The Town that Never Was is about the development of the nuclear bomb in Los Alamos, NM; Operation: Greenhouse is about the development of the hydrogen bomb; and Atomic Support for the Soldier is a terrifyingly bull-headed attempt to justify the use of nukes in combat by "demonstrating" to soldiers in an exercise how they could continue to pursue an enemy in bombed territory. These three short films are probably even more disturbing for their horrifyingly asinine credulity than the feature is in its frightening statistics. Countdown to Zero should be seen by everyone. Although it could have been more thorough and inclusive - and much longer - the film is still extremely important. A harsh reminder of the insane "values" that shape the world we live in, and a hopeful suggestion that all is not lost as long as we still have the capacity to eliminate nuclear weapons from our considerable list of worries, Countdown to Zero should be screened in homes and classrooms around the world. Highly recommended.